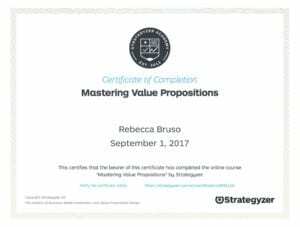 September 1, 2107 – Becky Bruso has completed the Strategyzer Value Proposition Design Course. This course is an online course that teaches how to use the Value Proposition Canvas to better understand customers, design value propositions they want and differentiate from the competition. This training uses a framework presented in the popular books The Business Model Canvas and Value Proposition Design. It is used by over 5 million people.